DCI took home two gold and a silver medal at the International and Festival Events Association Pinnacle awards today, winning gold medals for Best National Television Program and Best Event Program (with interior four or more colors). DCI.now also received a silver medal for best online newsletter. All three awards are in the category of events with budgets between $500,000 and $1.5 million. Each year the International Festival and Events Association recognizes outstanding examples of quality and creativity in the promotional programs and materials produced by its member festivals and events around the world with the Haas & Wilkerson Pinnacle Awards competition. For nearly three decades, these IFEA media awards have honored many promotional and media initiatives. Distributed throughout the summer, the 2003 SUMMER MUSIC GAMES Tour Souvenir Program book was designed by Laura Bratt of DesignAura. The DCI World Championship television broadcast produced by Tom Blair Television, and it aired on Public Television stations throughout the United States and Canada. This prestigious competition strives for the highest degree of excellence in festival and event promotions, and in doing so has raised the standards and quality of media promotions industry wide. Events of nearly every type and size have the opportunity to be recognized, as entries are categorized into organizations with similar sized budgets. The IFEA membership has been an outstanding example of how event producers can use innovation and creativity to acheive higher goals. 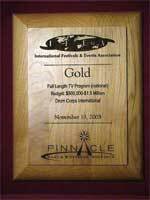 All Pinnacle Award Gold winners will be announced and presented during an Awards luncheon at the 48th Annual International Festival Events Association Convention in Anaheim, Calif.